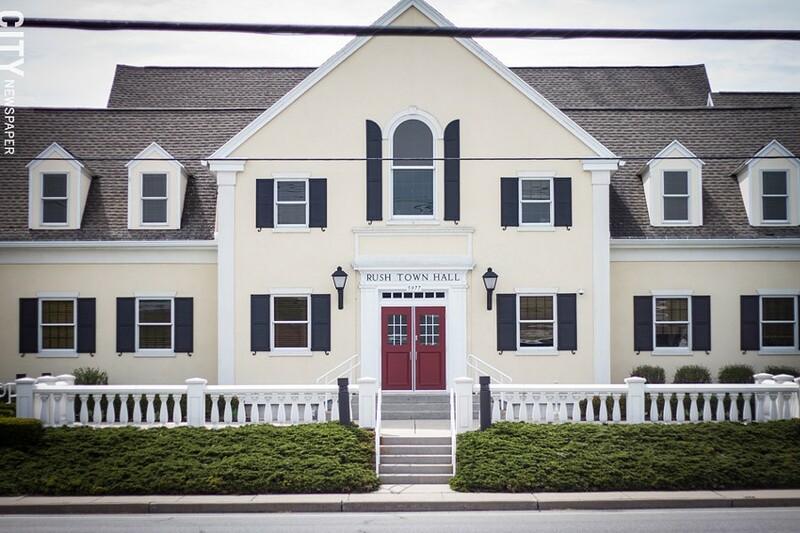 PHOTO BY KEVIN FULLER A focal point in the small Monroe County hamlet: the Rush Town Hall. Suburbs often talk up their rural-style charms: their houses aren't packed quite as tightly as in the city, their parks and open spaces are airier than their urban equivalents, and things are generally quieter. Some suburbs still have working farms in their borders. But the Town of Rush doesn't just feel rural, it is rural, mostly. The houses are spread out, often separated by fields or a few hundred feet of lawn, not just strips of grass or fences. The town of around 3,500 people also has a smattering of farms, greenhouses, and other agricultural operations. Ag uses about 39 percent of the town's 19,989 acres, according to a 2015 Monroe County report. And at the heart of the town is the Hamlet of Rush, a village-like place along a mile or so of Route 251. Town officials want to get residents' ideas for the area's future, so they've arranged for a June 10 charrette and have brought in the Community Design Center Rochester to help prepare for and lead it. "The goal is to provide that opportunity and gather that input so that we have information to then guide the direction of the town," says Rush Supervisor Cathy Frank. Communities across the region have been paying attention to their centers, whether in the form of villages or well-traveled crossroads. The people living and working in these places often see opportunities to better define their communities or make them more vibrant. Rush officials are focusing on the town's hamlet because they see many of those same opportunities. The hamlet is located along a heavily used route to other rural Rochester-area communities, and it's an area where houses, a couple of auto repair shops, a hair salon, churches, Town Hall, the Rush Public Library, the Rush Fire Department, and restaurants all mix together. Rush leaders have some of their own ideas they want to discuss, such as a potential community center, Frank says. But they also want to talk about building the town's identity and branding, including a tagline and logo. "Because of the school district, everything is referred to as Rush-Henrietta," says Maria Furgiuele, interim executive director of the Community Design Center Rochester. "Many people don't realize that Rush is a physical place." The charrette could include discussions about distinctive gateways and signs for the hamlet, both of which would tell people where they are and would signal to them that they're in a unique place, Furgiuele says. Gateways and signs are frequent charrette topics, she says. The discussion could also touch on drawing people to the hamlet through recreation, Furgiuele says. Honeoye Creek courses over a waterfall at Veterans Memorial, while the 15-mile Lehigh Valley Trail crosses Rush and Mendon. The town could create activities or events around those features, she says.